This is where we commenced our photo session with our local photographer Pierre. We got off the taxi out the front of Notre Dame. I was wearing my pair of purple UGG boot and a navy colour duck down coat over the top of my my vintage lace wedding dress – not the most stylish combo but anything decent that keeps me warm could do in those chilly winter days in Paris! I reckon I totally looked like a runaway bride. It was two days before Christmas so it came with no surprise that troops of sightseers were gathering out the front of this famous grand lady of the city. How I wish I’ve polished my posing/ modeling skills before the session! Posing ‘naturally’ is sometimes not an easy task when you’ve got large audience around! Well, my best tip? Dance like nobody’s watching. 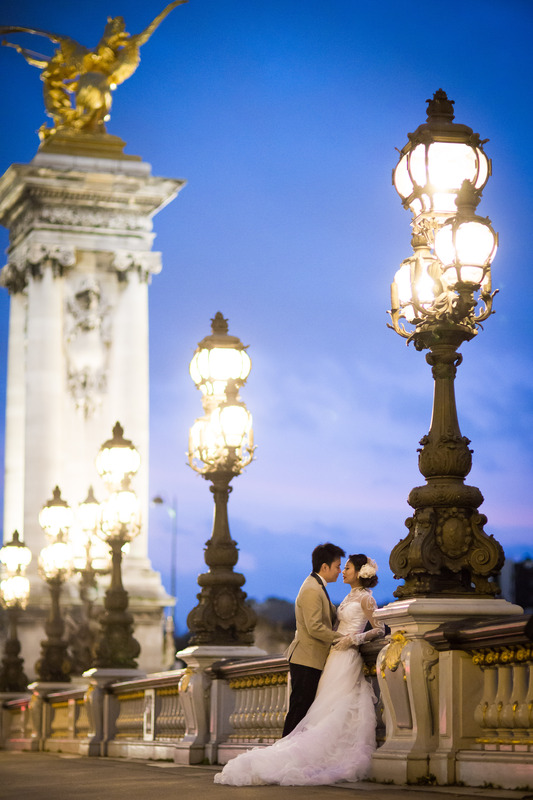 The Seine, the cobblestone streets, Le Louvre, La Tour Eiffel and Alexander III Bridge all made the perfect fairytale-like backdrop to our Parisian photo shoot. Capturing l’heure bleue (the blue hours) in the evening when the city just lights up for sure added some stunning and dreamy effects! Last stop, we made it right underneath La Tour Eiffel, just the perfect timing when the light show was on and the Eiffel Tower was dazzling in spectacular gold and silver glitter. C’est maginique! It was a little bit more than three hours of penguin-like cuddling trying to look cool while staying warm – and it all ended on an amazing note. P.S. Best tips: Pierre is extremely friendly and helpful local photographer based in Pairs, if you’re like me who is the first-timer to Paris and are looking for suggested itineraries for your photo sessions, get in touch with Pierre and he can start bouncing off some suggestions for you! Great work Juliet ! Don’t stop blogging !!! That’s so nice of you, Pierre 🙂 Thanks for dropping by my blog! you two look so adorable!! Thanks for dropping by and following my blog! Hello! 😀 I was the one who wrote the quick post Not just a Photographer! on my blog. You are an ahmazing photographer yourself!! Lovely, Lovely pictures!! Ooh how sweet of you Yelena x Thanks for stopping by my way and spreading the love! Paris is truly a city to fall in love with, totally amazing in those Christmas lights! It’s hard to even process how pretty these pics are. I have seens some AWFUL wedding photos, but these are like you are living inside a movie, or a fairytale that the rest of us can only dream of. It makes me want to toss my Nikon in the dirt and buy whatever Pierre has. Love this post – fabulous wedding gown and lovely photography. Thanks for your support of mine! My pleasure, I love your amazing collection of vintage! Where are you based, and from city do you usually source your vintage treasures? Unique vintage items are rare find these days! Thanks so much Johanna for stopping by and spread the love! Ooh thank you Andrea! Glad that you like my blog. I love this city so much. Beautiful photos!! I’m totally in love with Paris and miss their pain au chocolat dearly! Now I’m craving for one this morning 🙂 Thanks for stopping by here, have a blast in Maui for your honeymoon! Thanks for stopping by my blog Robert! Good on you for joining for B4Peace initiative! Lovely blog! So glad I found u on Instagram! Your photos are so beautiful. I have arranged a photographer to have my wedding photos taken in Paris in a month and I am now looking for makeup and hair stylist in Paris. Do u have anybody to recommend me? Thanks so much. Keep up the good blog! Hello Ivy! Thanks so much for stopping by my way and I’m thrilled that you like my wedding photos 🙂 My MUA in Pairs is Moon and she’s amazingly friendly and professional, I’ve just emailed you her details. You’ll make a stunning bride for sure, can’t wait to see your wedding photos from Paris! Many congratz for turning a mrs, when is your big day? Pretty, I like the sleeves. Weren’t you afraid of getting your dress dirty though? What date is your wedding planned? I love how feminine and girly, yet refined your gown was, it really gave me a sense of old paris glamour! Btw I think you should Qi Pao definitely! You’ll look as gorgeous as an Asian doll for sure! I rented one for my wedding and the look & feel of the photos are totally different from the wedding gown ones, sort of carried that old Shanghai glamour! Thanks for the kind words 🙂 Glad that you enjoyed reading my post! Hello, thanks for visiting my blog and that’s an amazing dress (what a train)! Some STUNNING HDR photography, here. I especially love the second shot in the above series, with the two of you on the iron staircase and a defocused Eiffel Tower in the background. Holy cow! I have never seen any portraits so beautiful! 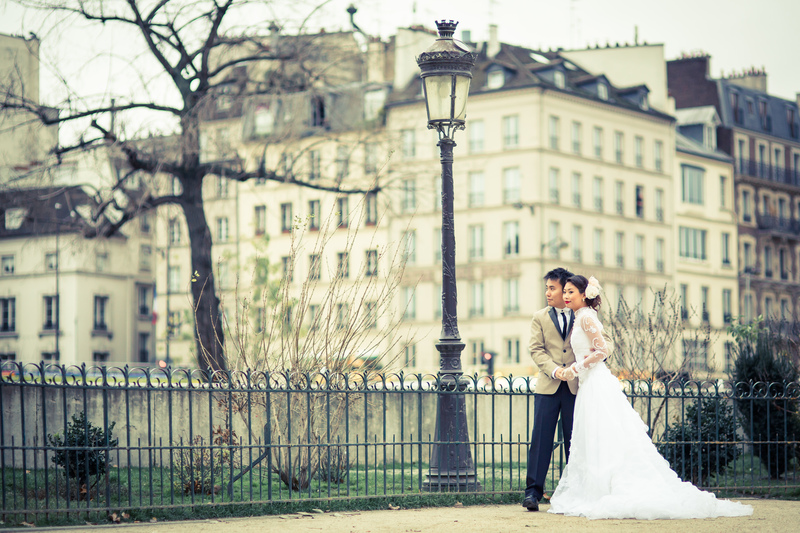 What a lovely idea (and I love elopements — and Paris)! Congrats to you both! What romantic photos, did you actually get married in Paris or was it just a professional shoot? These are absolutely gorgeous and breathtaking! Incredible! Makes me want to go back to Paris, the photos really capture the spirit :). And you looked amazing! OH! That was incomparably one of the most inspiring posts I’ve ever read! many many happy days ahead to you and your loved one. I’m terribly jealous and yet also infected by the joy exuding from this post. These are some of the most touching wedding photographs I have ever seen! How romantic!!! Wowser – just came across your blog. This doesn’t look like a real person’s wedding- AMAZING. That dress!!! Wow lovely to have you here Alice. Paris is forever the dreamiest destination and I’m in love with my dress as much as I’m with my man haha! Thanks for commenting, I want to take home everything from your store!